Cars tout their safety features and reliability all the time, but windshields are usually overlooked by advertisers and salesmen. Understanding the structure and purpose windshields serve should be something all car owners are aware of. All windshields are constructed of two layers of glass, laminated and tempered, with a sheet of vinyl placed between them. The vinyl fuses the glass together and is what keeps the windshield from shattering in the event of an accident. Aside from that, windshields are an integral part of the roofs stability. Cracks and chips come in all shapes and sizes. And for all manner of reasons. If that dump-truck you followed to work this morning was full of gravel and some came flying into your windshield, check it out once you make it to your destination. Knowing if the windshield is chipped or cracked could save you a lot of money down the line. Chips that are smaller than a quarter, and cracks no longer than 12 inches, can usually be taken care of in a matter of minutes. Anything larger than that could affect visibility while driving, or have already compromised the safety of your roof. Location also helps determine how serious the damage is. Any that are along the edges have a tendency to spread much faster than those in the center. Yet, those centrally located ones are far more likely to impair vision while driving. Since these larger damages are a more serious threat to your well-being and wallet, contacting a qualified technician to accurately assess how bad it really is, should be priority #1. Most of the time, these can’t be repaired simply by filling it with resin like the small dings, so replacement may be in your future. You may think that that tiny chip is minor, but there’s no telling whether or not it will grow into a spidering web that takes up a good chunk of the windshield. Extremes in temperature, water freezing in the space, or even just driving could cause it to get worse. 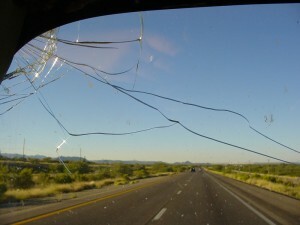 Repairing a windshield is quick, easy and cost effective. So before you decide for yourself that it’s doomed or saved, let Sallas Auto Repair be the final judge.